Hardiness Zones 5 to 6. 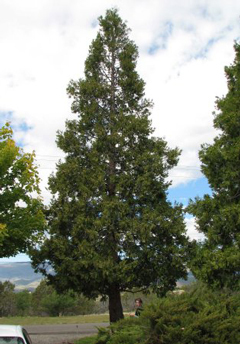 Growth habit Evergeen conifer with a strongly pyramidal growth pattern as a young tree maintaining that narrow habit as the tree matures. Foliage Bright green needles grow in a fan-shaped arrangement. 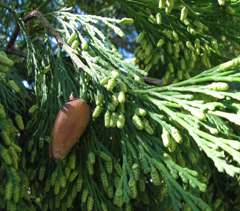 The needles have a unique “fluted wine-glass” arrangement on the needle, which prevents it from being mistaken with red-cedar. Twigs Young branches are smooth and brown in color. 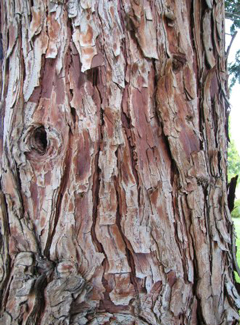 As branches mature there is a slightly reddish color to the bark. Flowers and fruit Male flowers are pale greenish yellow and abundant at the end of the needles. Female cone is cylindrical up to an inch long. As the cone matures it opens and resembles a bird’s beak. Bark Multi-colored bark that is mostly gray with reddish-brown streaks. Bark flakes off on younger trees. As tree matures the bark goes from slightly furrowed to deep furrows. 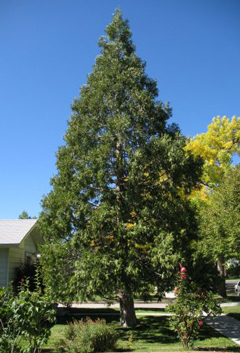 Landscape Value The largest specimens in Colorado are only 50 foot tall. This is an unusual conifer for Colorado landscapes, but the fact that it is growing in Western Colorado at all should steer more people to try. It seems to be tolerant of clay and alkaline soils. Where it grows naturally the summers are hot and dry. The wood from this tree is used to very valuable in the construction field. A unique feature of the wood is that it is used for pencils, because the wood is soft, easily shaved and has straight grain.